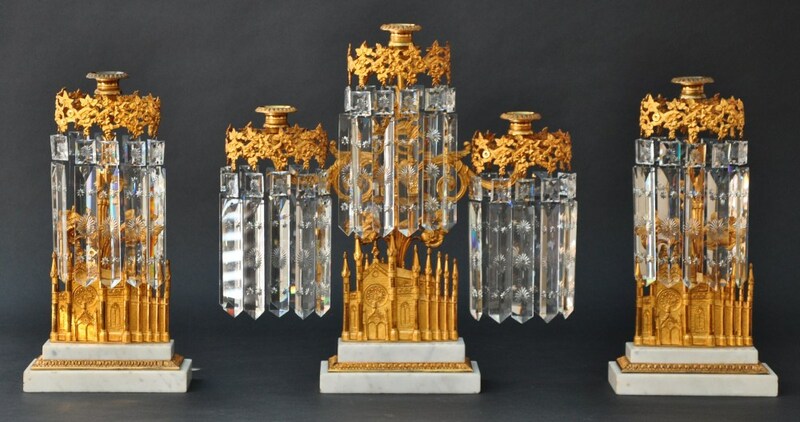 Exquisitely detailed, these girandoles retain their original rich two tone gilt lacquered finish. 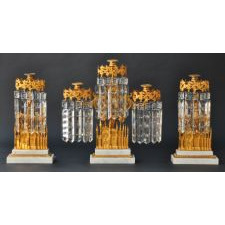 The double stepped base and the decorated prisms are indacative of a more sophisticated model than was usually offered. The prism rings are composed of cast grape vines and clusters. This pattern is referred to as the Bigelow Chapel model and is named after the chapel at the Mount Auburn cemetery in Cambridge, Massachusetts. The cemetery was America's first nonsectarian burying ground. The maker, William F. Shaw, was one of Boston's premier lighting manufacturers from about 1845 to 1900. Measurements 17 3/4" / 15 1/4"